THIS place will wow you! Blue Sky Mountain Ranch, one of the very FEW private mountain Colorado vacation rental properties you need NOT leave the property to enjoy your vacation! Blue Sky Mountain Ranch's SETTING is the star, but the 3 distinct accommodations are just as unbelievable. Blue Sky Mountain Ranch is so exclusive & private, you'll feel like you're the only humans on the planet. On the other hand, you're in close proximity to all things one expects TO DO in Colorado. See the Events page for event rates. Read more about "Things TO DO" on our Activities Page. Or learn about the towns close to the ranch that are worth a visit below. With over 100 acres of pure mountain view bliss & wilderness to "play in", you'll be beside yourself. Outside explore our seasonal stream, hills, valleys, the boulder fields, ridges, cliffs and our beautifully diverse evergreen forest, aspen groves & flowery meadows. so you can enjoy even more exploring. It's one of the most unique vacations you'll ever treat yourself to! 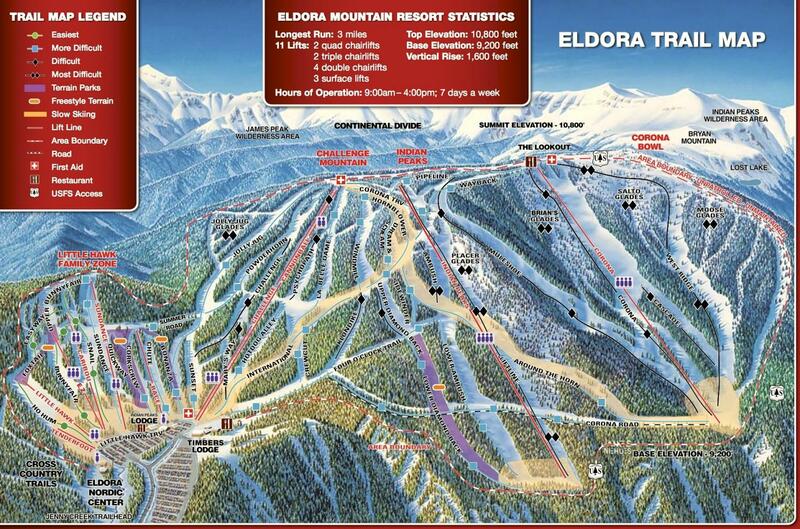 Eldora Ski Resort, a quaint ski area that is big on skiing lessons and HUGE on fun. Only 10 miles away from the Ranch, you'll have a blast during the winter months. Nederland, a mountain community at 6 miles from the ranch feels like an old village, quaint with friendly people, restaurants, a carousel, mining museum, pubs and the famous Pioneer Inn, a watering hole which has nightly entertainment 'bands' where the famous have frequented including the likes of Billy Joel, Rod Stewart, Carole King, Stephen Stills, Waylon Jennings and Dan Fogelberg. You'll truly feel like you are in the highlands of Europe but with the advantage of English speaking people and the USD to purchase your gifts with! Blue Sky Mountain Ranch is conveniently located in between the towns of Nederland & Black Hawk, making a visit to both places quick & easy. We are also conveniently located close to Hwy 72 within 2 miles and (HWY 119) within 6 miles, making access to the ranch much easier than most mountain properties. This makes getting to Denver, Boulder, Golden or the larger ski areas a snap. 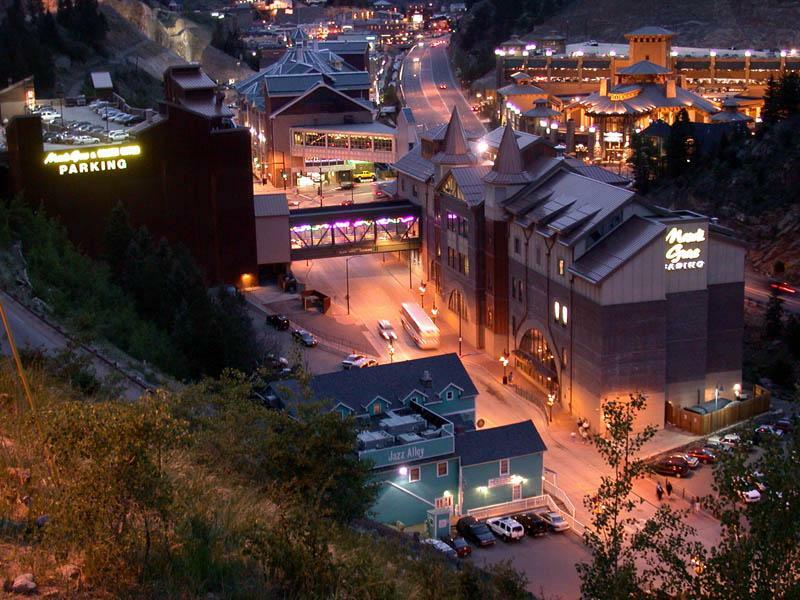 Black Hawk, at 19 miles from the ranch features many Casinos, it's charm as an old mining town with its historic appeal is a must see. 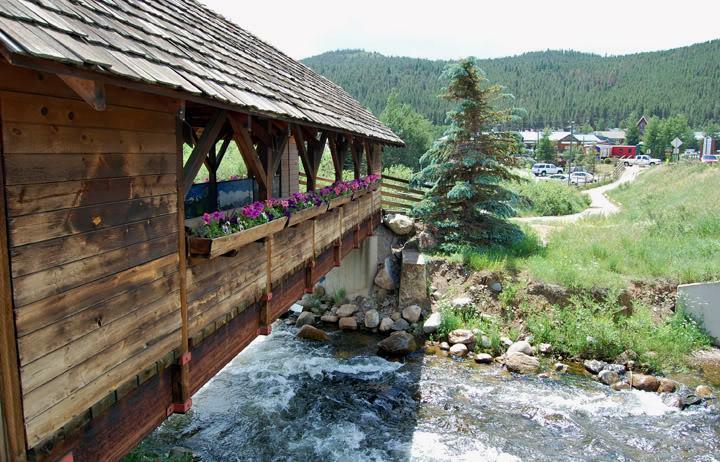 Idaho Springs, a mountain community at 32 miles from the Ranch is a mecca of fun Western type activities. This is where you'll go white water rafting on Clear Creek. It's also where you can go zip lining, tour a few gold mines, take a soak in the infamous Indian Hot Springs, drive "Oh my Gawd Road", or simply walk the town's shops or enjoy lunch by the creek. Boulder, a flat land community at 23 miles from the Ranch is a village type of experience. 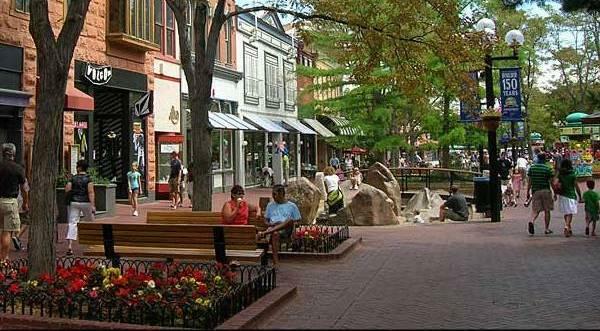 Pearl Street shown in the picture here is great for shopping, eating and watching the street entertainers. 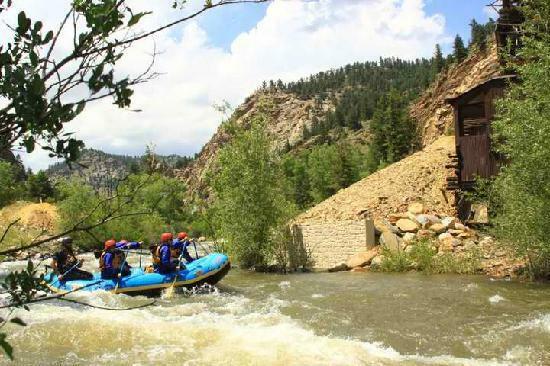 There's also brewery tours, wine tours, foodie tours, trolley's, and tubing down Boulder Creek. 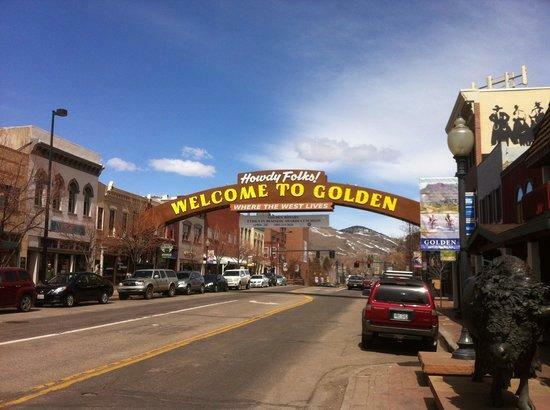 Golden, a flat land community at 26 miles is a quaint town that is famous for Buffalo Bill's grave site, the Colorado School of Mines the oldest mining school in the US, the COORS Brewing company, a herd of Buffalo that the county maintains, Dinosaur Ridge which is an outdoor museum featuring fossils extracted from the area and Dino footprints still in their natural state. 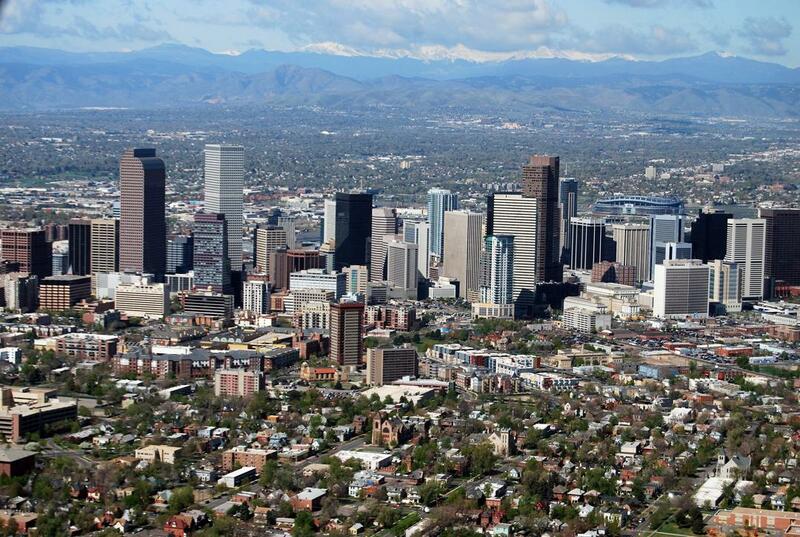 Denver, "the mile high city" is a major metropolitan area on the high plains of Colorado and only 40 miles from Blue Sky Ranch. This metro area is very different than the rural areas of Colorado that Blue Sky Ranch enjoys. But if you want some city life on vacation, the crowds, the bars, the food, the shows, the tours, the amusement parks, the zoos, the museums, the festivals, the Rockies, the Broncos, the Avalanche, the Nuggets and countless other activities, you'll want to visit the city.